I know the headline above suggests that I'm going to explain what debits and credits really mean. Actually, I'm not. The diagram above shows what is known as the five elements of accounting: assets, liabilities, owners equity, income and expenses. It also summarizes what side each of these five elements occur or increase on. 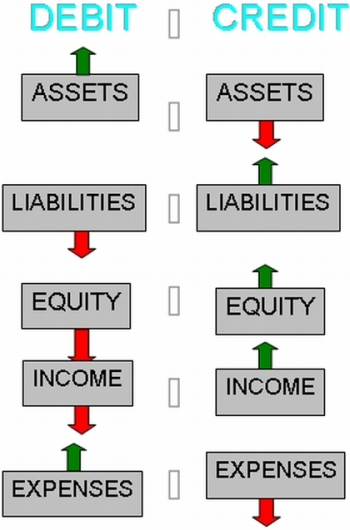 The side that assets, liabilities and the owner’s equity occur or increase on is the same as where we've shown them so far in our original accounting equation. We then looked at how income and expenses relate to the owner’s equity, and accordingly worked out what sides they occur or increase on. So now we know what side they each occur or increase on. Along the same line of thinking, these five elements decrease on the opposite side to that side where they increase. Thus an asset or expense decreases on the right side. 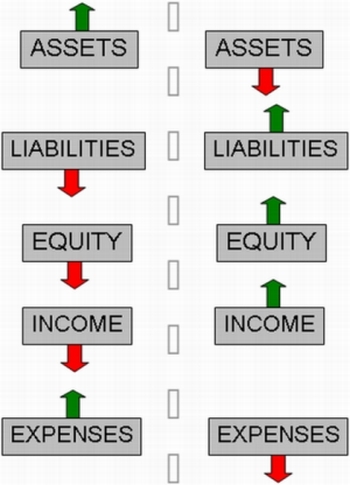 The owner’s equity, liabilities or income decrease on the left side. This is simply the opposite of what we just did above. ...means left or left side or making an entry on the left side. ...means right or right side or making an entry on the right side. Debit does not mean less money, more money, more owing, less owing, or anything else. It means left or left side or making an entry on the left side. Credit does not mean less money, more money, more owing, less owing, or anything else. When using it in its "debit and credit" sense, it means right or right side or making an entry on the right side. That is all these glorified terms mean. So next time you are driving, when you indicate to turn left, repeat to yourself: debit, debit, debit. When you make a right turn repeat to yourself: credit, credit, credit. Any time you record any entry on the left side, such as when anasset increases or when a liability decreases, you are debiting the asset or liability. Any time you record any entry on the right side, such as when income occurs or when an asset decreases, you are crediting the income or asset. And that, my friends, is the simplicity of debits and credits.